I have created two new videos. One of them is a tutorial on how to make a Goat Pendant. 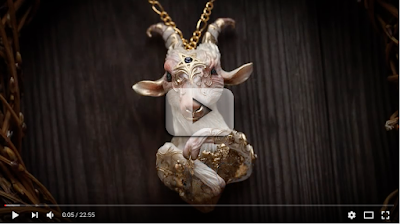 I love making goats and rams very much and I think I have created around 3-4 pieces so far, that's why I decided to share this tutorial with you, so that you can learn to make one too. You can tell that I do love to work on details and I hope that you will also appreciate this tutorial for the same reason. My second video is just a preview of the "Snow Queen" ring that I have done. I loved making this ring because of the effects that I have managed to achieve. I love the frozen white porcelain effect of the ring base and the crystal that is crowning it, as well as the golden accents and bleedings that are distributed around the whole ring.